Peterborough Northern Star goalscorer Calum Madigan (stripes) in action against Kirby Muxloe. Photo: Tim Gates. Brett Whaley’s return to Yaxley FC sparked a stunning performance in the United Premier Division at Northampton Spencer last night (April 5). 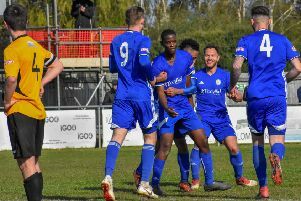 Whaley was appointed ‘Cuckoos’ manager for a second time on Monday (April 4) and 24 hours later his side were recording an excellent 4-1 away win. Peterborough Northern Star goalscorer Jezz Goldson-Williams (stripes) in action against Kirby Muxloe. Photo: Tim Gates. Forward Phil Stebbing was the star of the show with a hat-trick after top scorer Dan Cotton had opened the scoring two minutes before the break. Stebbing and Cotton could be a deadly duo capable of wreaking havoc next season. There was also a great start for new Peterborough Northern Star boss Raff Mazzarella. Mazarella stepped up from assistant manager to first-team boss following the departure of Seb Hayes and oversaw a fine 2-1 win over Kirby Muxloe at Chestnut Avenue. Calum Madigan and Jezz Goldson-Williams scored the goals for Star with the visitors replying with a late penalty. Holbeach almost claimed a terrific win at title-chasing AFC Kempston Rovers. Jack Smith’s 40th minute goal looked set to give ‘The Tigers’ a decent three-point return, but an injury-time equaliser from former Holbeach player Ash Fuller earned the team in second place a point. Old boys also haunted their previous clubs at Outgang Road as Deeping Rangers drew 1-1 with Sleaford Town. Former Sleaford man Scott Coupland gave Deeping the lead with his 25th goal of the campaign before former Deeping striker Ryan Oliver equalised for the visitors eight minutes into the second-half. In the Peterborough League Premier Division leaders Moulton Harrox smacked Stilton 6-1 at Broad Lane to establish an 18-point lead at the top with just seven matches remaining. Tom Panton scored twice with Ollie Maltby, Macauley Grimwood, Ben Allen and Phil Groves also on target. Peterborough Sports Reserves moved back into second place with a 4-1 win at AFC Stanground. The first PFA Cup Final of the season takes place at Chestnut Avenue tonight (April 6) when holders Parkway take on Stanground in the Senior Sunday Cup Final. There’s also a repeat of last season’s North Cambs Junior Cup Final between holders Wisbech St Mary and March Town United Reserves at Wisbech Town FC.